this part of the pie comprised 56% of Voters in Iowa. 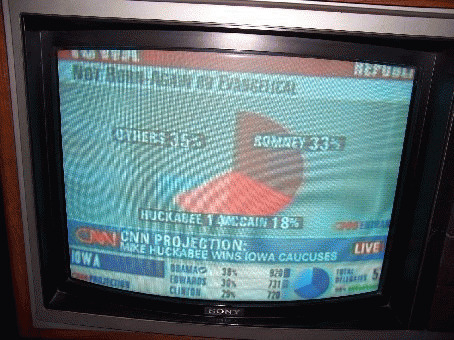 We know that with this percentage of voters to whom Religion is a very important factor, Huckabee took the prize. among NON Evangelical and Born-Again voters.....look how the numbers change. WHO do you suppose "Other" was? I would say that Giuliani would probably remain at 3% as he did not campaign as he could have in Iowa. OR maybe he would have gotten less than 3% because he is a Roman Catholic and the Religious factor might have put votes towards him so in that case he would lose votes. Hunter is a non-entity at this point with 0%. Thompson is also on the "other" part of this pie so this is truly Paul's competition at this point for the Non-Religious Vote. I have a feeling Ron Paul might do VERY well in New Hampshire where the vote is not based on Religion so much as it is based on the Issues --especially those of Pro-Peace and Living Free. Fred Thompson is NOT on the Pro-Peace and Living Free side of the issues. He is probably more competition to the McCain/Huckabee/Romney Pro-War Trio. I'd say that Ron Paul's piece of the pie might be pretty big in New Hampshire!